Technical analysis stock market routine is one tool which could make your life as a trader or an active investor much easier. If you want to be profitable or make money for your living from trading activities, you should perform an analysis of stock market regularly. It can be daily or several times a week. The active investors should analyze markets once a week at least. Although many investors use fundamentals to analyze markets, the best way how to understand what is going on the markets today is to look at the charts. And you know fundamental analysis is not very usable for everyday short term trading. Such chart analysis could be done quickly and using only a few simple tools. So do not worry to spend a lot of time doing this. Here are my tips and recommendations based on my technique for technical analysis. The market analysis could be divided into these points. As my main place to trade is US exchanges, I write it from this perspective. What is the current situation in US markets? Are they bearish or bullish? This point is important to know what type of trading strategy you should use in the current situation. You do not want to use a long only, buy on dips strategy during a bear market. This is my actual shortlist I check several times a week. I use ETF shares for such technical analysis. Stocks – exchange traded funds – represent parts of total US markets. I check all important sector ETF shares I have in my list of ETFs. Then I select some which present the best relative strength or best relative weakness to US market indexes and put them into my watch list for further monitoring during a trading day or trading week. 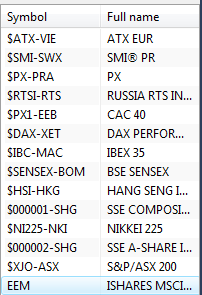 I also trade international indexes in my portfolio. 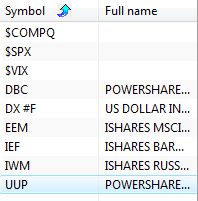 So I perform analysis of these indexes too. I monitor and analyze major European, Asian and Lat-Am indexes. Knowledge of the situation on some international markets could help in deciding what could happen in US markets. There are times when local economic situation could affect the mood of investors on US exchanges. These times were experienced during the European debt crisis since 2010 or the situation in the Chinese economy during the same period. My list includes these tickers. I check them once a week. I use several watchlists that contain tickers based on my method for stocks picking and ETF picking. There are watchlists for bullish and bearish ETFs found by my method for selection of best ETFs. Another watchlist is created by my best stock screeners I use for scanning the market for best picks. These examples could provide you ideas about how to create your own technical analysis stock market routine. Markets are huge and you as a trader or investor should make your hard work easier. Such a list of routine tasks is good tool. And you could have one list for daily routine and one for weekly technical analysis stock market routine. I use similar routine every day together with my method for picking the best stocks and ETFs to achieve most profitable results.